The Twin-Jet Jetta was painted a lurid bright yellow and wore a modified BBS body styling kit. The second surprise to emerge from the VW Motorsport workshops was their answer to the Audi quattro in the form of a twin-engined Jetta. This prototype, affectionately known as the Twin-Jet, was painted banana yellow with a colour-coded grille and had a headlamp set-up similar to the US-market version. A body kit with integrated front spoiler and over-bumper sections that blended into the extended wheel-arches gave the car a more purposeful look and covered the 205/60VR-13 Pirelli P7R tyres that were supported by 6J x 13in ATS alloy wheels. The Twin-Jet was the brainchild of Klaus-Peter Rosorius, Head of VW Motorsport since 1972, and Kurt Bergmann from Vienna, one-time builder of all-conquering FV cars. The idea was a bit of a wild card in the pack, but Rosorius was determined to pull it off as a good PR exercise even if it did not work as a rally car. Because the Jetta has a transversely mounted engine, it was necessary to have another complete drivetrain package at the rear, whereas had the engine been mounted north-south, a single gearbox could have been used. In the event, the underbonnet structure from a second Jetta was spliced in to a reinforced boot area. This gave the car a suspension identical to the front save for the a use of Heim-jointed tubular lower arms in place of the front-end’s pressed steel arms. A new heavy-duty anti-roll bar was made up for the rear to balance things out, and a pair of front ventilated discs joined the rear axle assembly. As things were arranged, you could choose from front drive, rear drive or four-wheel drive, so a brake proportioning control was mounted on the transmission tunnel. The handbrake had hydraulic actuation. The two power plants were standard 110bhp 1,588cc GTI units and the Twin-Jet thus had a combined thrust of 220bhp at 6,100rpm and 202lb/ft of torque at 5,000rpm. The ignition and fuel systems ran independently of one another, but a large capacity radiator served both engines and this was supplemented by an additional electric fan at the rear. While the gearboxes were standard Jetta GLI close-ratio five-speeders, the final drive was raised from 3.90:1 to 3.70:1 to make full use of the greater power in top speed terms. A limited-slip differential was incorporated into the rear transaxle. The kerb weight of the car was just 2,3101b compared to the 2,0461b of a normal Jetta GLI. With superb traction in 4WD configuration, this gave the car very impressive performance and, in truth, the car worked out far better than its builders had hoped. In 12,000 development miles, covered in just a few months after it was built in 1981, the Twin-Jet spurred Rosorius into giving the go-ahead for a twin-engined version of the just-launched Scirocco Mk2. The twin-engined Scirocco in action. It was a fully operational prototype and would have made a fine rally car. With the twin-engined formula working successfully in the Jetta with standard engines, VW Motorsport were confident enough now to shoot for the limits of the drivetrain’s capability with the twin-engined Scirocco. The new 1,781cc engine slated for 1983 model-year production was not yet available, so VW Motorsport asked its contract engine builder, Eckhart Berg, to increase the bore and stroke of the existing 1.6-litre engine to achieve the larger capacity. With a bore and stroke of 81.25mm x 86.4mm, the larger engine worked out at l,791cc and the twin engines were thus equivalent to a 3.58-litre eight-cylinder unit. Internally, forged pistons and reworked combustion chambers increased the compression ratio to 10.9:1 and, with hotter camshafts, the output of each engine was 180bhp at 7,200rpm with 1481b/ft of torque at 5,800rpm. Helping to achieve this was a Zenith Pierburg racing fuel injection system with one throttle body per cylinder. These were basically rallycross-spec motors. Two twin-engined Sciroccos were to be built, one for evaluation and testing and another to do shows and the like. 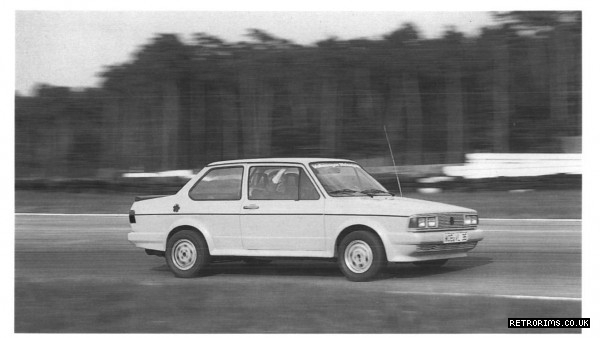 The first car was also built to convince the VW Board of the potential of the car, and it just happened to have 54bhp more than the Audi Sport quattro rally homologation special, which it equaled in acceleration and bettered in top speed, through taller gearing. VW Motorsport and Audi Sport were run as two distinct and separate departments and one detects an element of rivalry between them spurring the VW engineers on, for it was the Audi branch that was getting all the limelight in international rallying at this period. The power was fed through a pair of single-plate sintered-metal clutches to identical fivespeed gearboxes. Each end of the car had a limited-slip differential and, if a high final-drive ratio was opted for, the theoretical top speed was close to 180mph. In the event, the car ran with a short final drive and this gave it blistering acceleration. 0-60mph took a mere 4.5 seconds, enough to embarrass a Porsche 911 Turbo. 100mph followed 7 seconds after that and the quarter-mile trap closed on the car in 13 seconds. Perhaps the most ingenious feature of the twin engined Scirocco was the way the engines were synchronised. Given the title ‘E-gas’, which means electronic hookup, the linking system was deceptively simple. A single throttle cable ran back to the rear engine where a potentiometer measured throttle position and sent a signal forward to operate a valve on the other engine. While the Scirocco retained the ability of the jetta to run on front, rear or both engines, it had the additional refinement of a slide-operated throttle potentiometer which adjusted front engine power and thus the front-rear power split. The car was hardly nose heavy with a good 52.6/47.4% front/ rear weight distribution, but even so it was a great advantage to be able to dial in different handling characteristics at will, especially when it came to countering understeer on loose surfaces. The gearboxes were mechanically linked by rods and cranks, with a small pneumatically operated plunger device connecting each of these assemblies near the gearbox to lock out one or the other shift mechanism in the event of a single engine failure. The bodyshell modifications were different from those of the twin-motor Jetta. A suitable hole was cut in the shell to accept the rear drivetrain which had to be angled forward from the rear axle line. The other modifications followed the proven formula used on the Twin-Jet however, and Bilstein dampers were used together with adjustable suspension, and 10.5in vented disc brakes all round with four-pot racing calipers. The wheels were 7J x 15in Centra alloys shod with 205/50VR15 Pirelli P7s. 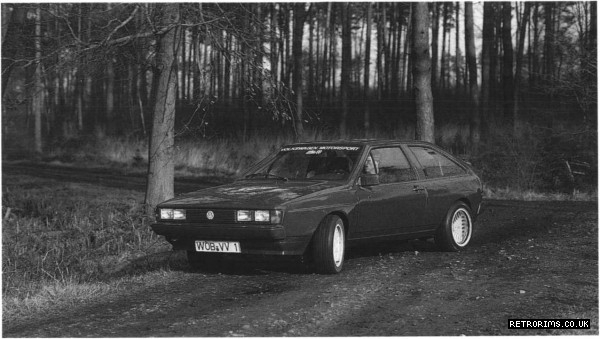 The second Bimotor Scirocco was a rather different animal. The project was now in the hands of Dr Ulrich Seifert at VWs Development Department and this metallic red car was brought to a state of finish where it could have been put into limited production. The car wore a specially moulded body kit which encompassed front and rear bumpers, and quattro-style wheelarch flares with engine intake grilles let into the leading edge of the rear ones. (Wheels were from an early Audi quattro.) The twin exhaust pipes at the rear were neatly centered in semi-circular cutouts rather than simply protruding from the bodywork. Open the rear hatch, and the standard of finish continued to impress. The engine compartment surround was braced with a metal frame that formed a rigid structure from the tail panel to the bulkhead, and this was carpeted. With the engine cover in place, the whole installation was hidden from view. The interior of the car was equally neat. Instead of a battery of supplementary gauges hogging the centre console as in the first prototype, a custom made instrument panel had been assembled specially for the car by VDO who make all the instruments for VW. Fitting into the standard instrument pack hole, this contained a matching pair of rev counters with an LCD-readout speedometer in between. The bottom of each rev counter contained a small water temperature and oil temperature gauge, mirror imaged, and in the centre was the petrol gauge. The under bonnet view was impressive. Now that the factory l,781cc engine was in production, this early 1983 prototype was able to use the new block and coupled this to Oettinger 16-valve heads. This 1800E/16 engine gave 141bhp at 6,100rpm and 1251b/ft of torque at 5,500rpm. The fuel system was a modified Bosch K-Jetronic and the compression ratio was 10.2:1. The surprise factor in this research vehicle was that the complex gear linkages connecting two five-speed manual gearboxes had been dispensed with in one fell swoop by using a pair of threespeed automatic gearboxes. The torque convenors were modified to optimize their response and the gearbox change up points were adjusted to suit the characteristics of the sporting Oettinger engines, and the whole set-up worked very well because the slight slip in the torque convenors would help to compensate when the two engines were running out of synchronization, as when the power balance between the front and rear engines was being modified. Recently in London, whilst exploring the city I was amazed to see this extraordinary vehicle slowing emerging from a lorry trailer. At first I did not know what it was, then as it was revealed in its entirety it became clear that it was the VW XL1, I was ecstatic, it’s great to be in the right place at the right time! 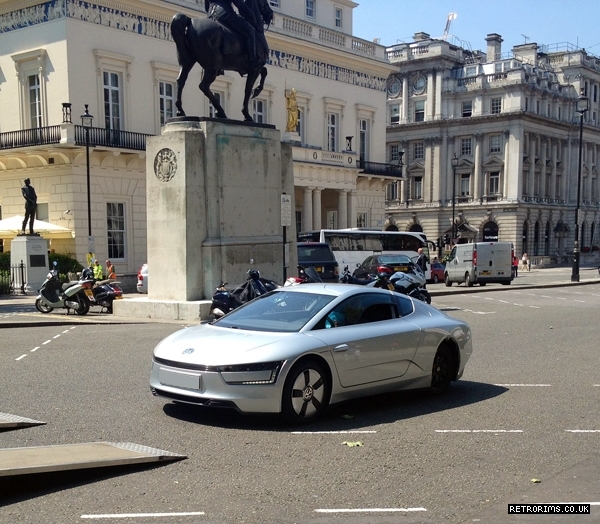 I thought I would share my pictures of the VW XL1 on my blog, it truly is an outstanding piece of work by VW. It is worth noting that the rear wheel arch plates are missing, they were taken off whilst it was in transit.